Out of the blue, I'm into Alignment Meditations. They take less than 5 minutes—because it's not that hard to align. In fact, alignment is all about ease—the antithesis of straining, striving, forcing, contorting--so it can only be easy to get into alignment. Sound too easy? You know when you're out of aligment. If you're out of whack with a person, everything between you gets needlessly complicated. Out of whack with a place—just feels wrong to be there. Out of whack with a role you play--you feel miscast, even fraudulent. You can be out of alignment with your own body, ay, and that's hard to reconcile—like the discord originates with you while it's also externally imposed. In any case, you know you're out when you're out. The misalignment may not be your doing, so doing isn't likely to make it right. (Kind of radical, really.) You can't require another person to show up the way you want them to. You cannot force your way into some society or require it (with its many faces) to look upon you with unconditional welcome. You can't bend time or sway the timing of other minds or machines or the healing mechanisms of the body. You can't require what hasn't arrived to come forth now. So how do you align with a lot of moving parts that you (rightfully, appropriately, even mercifully) cannot control? Precisely. This is why a meditation is a great way to quit pounding on the door that won't yield to you, so you can slip in the back way with your breath slowed down. Alignment requires nonresistance. Start there. Alignment goes well with surrender—the good kind. Let go. Let go of outcome. Let go of what the other person does or doesn't do, what others think, what they think of you. Let go of the future; definitely let go of predicting the future. Let go of how you thought it should go, what you thought you should feel, what level of evolution you thought you should have attained here. Whatever's happening is fine—really. The meditation: alignment first happens internally, energetically, as a powerful precursor to external change. Here comes the white-ligh part. Stay with me? To meditate into alignment, sit in a column of light, aligned with that light. Watch your breathing as you sitthere. Now imagine that the situation (person, group) you seek to align with isequally aligned with this column. This light represents and holds the alignment. It's a beam of light—the most effortless, uncrowded thing you might imagine. Now find where you're already aligned. Find your essential oneness with the other or the situation. Find the essential love that unites you. Find shared philosophies, mission, history. Find the passion for a topic, ethic, or aesthetic that all involved connect to, even where details of your visions don'tmatch. You may see lots of overlap and feel instant relief—and instantmovement toward alignment. You may need to drop down to the lowest common denominator: we're both/all children of the universe, inherently worthy. Or get scientific, if you will: we're made of the same stuff, exchanging the same oxygen and carbon dioxide. Anything real to you works. My simple meditation invites you to cast a beam of alignment and sit in it. Feel and breathe into what connects you with the thing, situation, concept, person, or group you're out of alignment with, and let go of where you're stymied by differences, disconnections, disillusionment. Sit in the truth of essential oneness. We're never separate, even when we feel separation.Oneness or unity is truly the way of it, so sit in that, the essential truth of that—never mind where anything in real life makes it hard to feel. Alignment may require ongoing tweaks and adjustments. 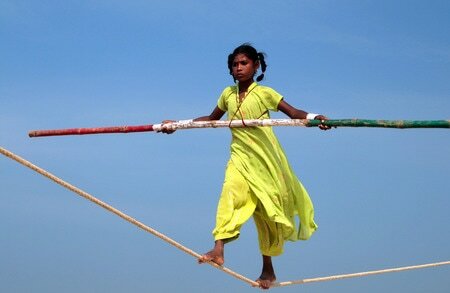 The tightrope walker steadies herself with the pole, weaving in and out of balance. Still, she walks the line, however tricky or dangerous it looks. Don't expect yourself to meditate into alignment then hold the alignment. Sit imagining and feeling into alignment for the love of alignment, not to indulge some magical thinking that you get to have your way if you use a spiritual tactic to have it. Align without expecting anything else to happen on the physical plane, in actuality. (This doesn't mean it can't or won't.) Align mentally just to have a private experience of alignment, whether you get it publicly or not, whether you get to share it with another or not. With a touchstone of internal alignment now available, you can keep coming back to alignment as you take action and events unfold--just because alignment feels better. While this doesn't guarantee any certain outcome, it does make feeling better super likely; it makes course-correcting toward alignment much easier; it makes the actions and tasks you step into from that alignment much more effortless. If you experiment with this at all, you simply cannot simultaneously white-knuckle it the whole way. Just play with it as you might try a yoga pose, testing the wobbly line between pushing and releasing. I've sat with a teacher, realigning her with the students she's not certain she's serving; a post-grad student, aligning her with a professor she thinks she'sdisappointed; an artist, aligning him with the unknown galleries that want to represent him. You can align with the employer who will hire you, the lover you haven't met, the baby on the way. You can align with the maddening political scene, the uncertain marketing thrust, the slippery social event. I do this often for myself, always briefly, always lighter and easier in the aftermath. There's really no formula. Even the column of white light is dispensable if it bothers you. Just sit with your breath, intending alignment with a task, concept, person, group. Sit breathing into the possibility of alignment andopen to where it already exists. Let go of striving and experiment with believing that the way is clearer, simpler, more accessible than you currently believe. It's easy to align. (Ah) Light on the Hill! Van Etten, New York. My favorite place to give a retreat! 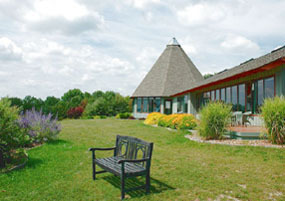 You'll be well fed, sleep in an individual cozy room, and have access to viewing or walking acres of gorgeous grounds. We focus on aligning with others & we're thrown off by disconnections from others. A better focus: prioritize & manage your alignment with yourself. Feel rejected by another? Don't go after them—it's all for you! Come close to any part of you that could still believe there's something wrong with you, something unworthy, some reason someone you adore would push you away as unadorable. Come back to you, your own experience, your own senses, now & now & now. Accept yourself—even sad, heavy, angry, confused. Mind your own dance with consciousness. Follow anything in your field of awareness that you're curious about. Walk through life with open eyes & beginner's mind. Accept yourself by valuing your own experience & dropping self-judgments. Scooch from self-acceptance to -adoration. Then, adoration ping-pong with others? Effortless.